The ceramists, potters and sculptors who make up the membership of the Ceramics Association of La Borne each present two or three pieces which define their current work. 10, 20 or 30 years of work, sometimes even more, summed up by 2 or 3 pieces of work. All of this means that the work selected is neither anodyne nor is it subjective. Each ceramist is putting on exhibition moments of life. All the works shown here invite the viewer to guess, to imagine and to reflect on their meaning. Ceramics is a mysterious art form, where everything happens out of sight, within the kiln. Every ceramist has his or her own language and relationship with the clay that is both personal and intimate. But what unites them all, regardless of how they choose to express it and by whatever means, is a love for fire. In 1962 the Association of the Potters of La Borne was formed, and its first exhibition took place, organised by Pierre Mestre in a former blacksmith’s forge located at the entrance to the village. In 1971, the Association with a membership of 12 people set up its exhibition in the former village school for girls, which had been made available by the municipality of Henrichemont. By 1981, the membership had grown to 25 and was organising the first temporary exhibitions of guest artists. In 1986, the first Professional Meeting of Ceramists took place, and others followed in 1988-1990-1992-1996-1998-2001-2004-2006- 2007 and 2010. In 1993, Association of the Potters of La Borne underwent a name change, becoming the Ceramics Centre of La Borne with over 40 members. 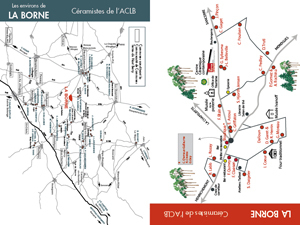 In 1998, ten years after the failure of the first proposal to extend the Ceramics Centre, the Association took a new look at the aims of the project and suggests the building of the Centre of the Creation of Ceramics of La Borne. In 1999 the articles of the association were deposited at the Regional Offices of the Cher Council. It was only in 2003, after several projects which did not come to fruition, that a steering committee worked on preparing a new list of specifications and requested a feasibility study to look at a future location. Once the Association was able to convince them of the interest of the project they had put together, in terms of culture, tourism and the economy, the public bodies and local councils provided funding for it. What overcame the scepticism and changed the minds of these bodies were the continuing efforts of the association and La Borne’s synergy and desire to work together. April 2010 saw the opening of the Contemporary Ceramics Centre of La Borne and the creation of a partnership between the Communauté de Communes des Hautes terres en Haut Berry (the grouping of local councils in the highlands of the Upper Berry region) and the Ceramists’ Association of La Borne, the management arrangements being carried out by the “Communautés de communes”. In November 2010 the association CCCLB amended its articles, becoming the Ceramics Association of La Borne (ACLB). Today there are 66 members. The Ceramics Association of La Borne cannot survive on just the membership subscriptions of its members. It also needs help from its supporting members. When you make the association and its activities known more widely, and by providing financial support, you provide the association with the ability to conceive of, to manage and to act in this cultural project, ensuring the scheduling of art events, the organisation of international meetings and creating exhibitions.